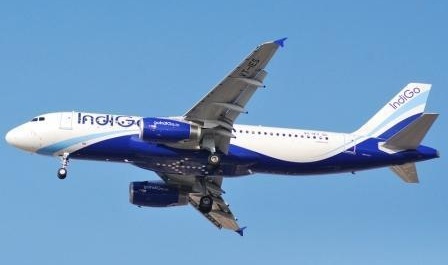 The much-awaited initial public offering (IPO) of InterGlobe Aviation – the parent of no-frills airline IndiGo – opens for subscription on 27 October. The issue has already created high expectations among investors but it is not without its own set of disadvantages. As a result of all the hype around InterGlobe Aviation IPO, it becomes even more important for investors to discount the spin and stay rooted to fundaments. First up, here are some basic details about the IPO. The size of InterGlobe Aviation IPO has been reduced from INR32 billion to INR30 billion and the price has been fixed in the range of INR700-765 per share with 10% discount for eligible employees. Yes, no discount for retail investors. 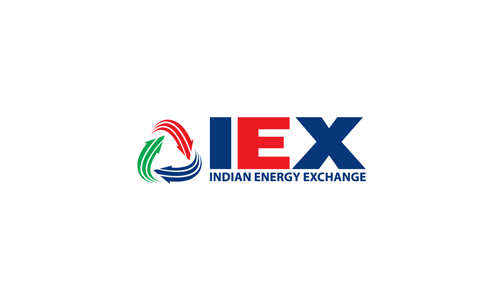 The offer comprises of fresh issue of up to INR12.72 billion and an offer for sale of up to 26.11 million shares. Ok, who are the sellers? Well, this has become a redundant question now. Promoters are selling, who else? Rahul Bhatia plans to sell 3 million shares while Rakesh Gangwal is aiming for 3.76 million shares. Rakesh is joined by his wife Shobha Gangwal who is offering 2.23 million shares. For whatever reasons, Shobha Gangwal is the fourth biggest shareholder in the company with a 10.48% stake. However, the largest number of shares (over 6 million) will come from Newton Bruce Ashby while InterGlobe Enterprises Limited is also in the race with 3.29 million shares. InterGlobe Enterprises is the biggest shareholder (45.6%) in InterGlobe Aviation while Rahul Bhatia directly holds only 3,046,000 shares. Following the IPO, Bhatia’s direct shareholding will reduce to just 40,000 shares. InterGlobe Aviation intends to use the proceeds from the fresh issue for retirement of certain outstanding lease liabilities, consequent acquisition of aircrafts, purchase of ground support equipment and for general corporate purposes. With the expansion of middle class, aviation travel is no longer exclusively for rich. 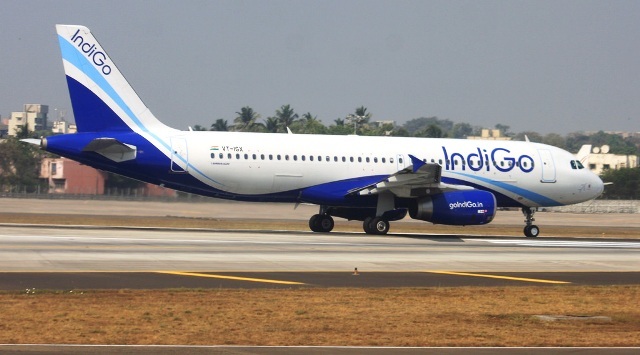 Since air-travel use is very low on per capita basis, IndiGo adopted a no-frills approach with low-cost carrier model (LCC) and low fares to further enhance its growth prospects. This has allowed the airline to maintain a very low cost on per available seat-kilometer (CASK) – a key indicator of how efficiently operations are managed. Among all the airline companies in India, IndiGo maintained the highest aircraft utilization rate of 11.4 hours per day per aircraft in fiscal 2015 by keeping turnaround time between flights at a minimum. Its basic no-frills service with no frequent flyer programme, food and beverages in ticket price and free lounges helps to further reduce cost. 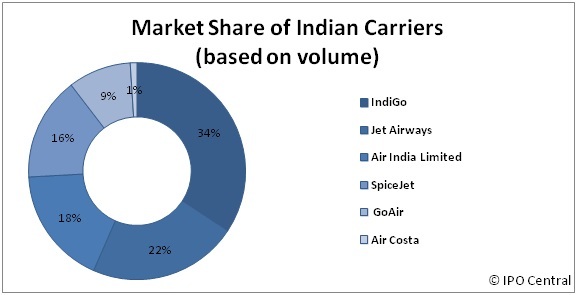 IndiGo competes with domestic and international low-cost carriers like SpiceJet, GoAir, Air India Express, Jet Airways, Air India, Alliance Air and Air Costa along with new entrants like AirAsia India, Air Pegasus, Vistara and TruJet. It is by far the leading player in the market – evident from the graph below. This is where all the operational excellence is translated into what matter the most – profits. InterGlobe Aviation’s net profit surged from INR4.73 billion in FY 2014 to INR129.55 billion in FY 2015. Besides GoAir, InterGlobe Aviation is the only domestic carrier that is not running in losses. This is achieved through several smart measures like usage of single type of aircrafts, a younger fleet, and sale-and-lease back arrangements which are called creative accounting by competitors. 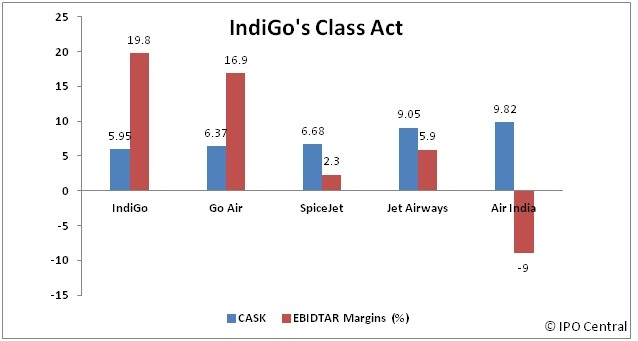 Without doubt, IndiGo has been a consistent player and has delivered robust performances in recent years. Even in the three months ended June 2015, the company posted a net profit of INR6.4 billion on revenues of INR43.17 billion. However, some of the policies of InterGlobe Aviation raise question marks on its capability to reward shareholders. At this time, InterGlobe Aviation’s net worth is negative at INR1.39 billion as the management decided to reward its existing shareholders– mostly promoters – with a massive interim dividend of INR10.03 billion. An otherwise reticent Gangwal has clarified that it is just “financial re-engineering” and the company will turn positive in net worth soon. We don’t doubt that and it is also true that InterGlobe Aviation has been paying such dividends in the past too. What’s new this time is that the amount of dividend exceeded cashflows. InterGlobe Aviation exercised discipline – something it prides in – in the past instances of dividends. As on June 2015, the company counts INR39.12 billion of debt on its books. This dividend could have been used to pay back some of the debt. While we understand rewarding shareholders is important and respect the management’s prerogative too in this regard, the timing and quantum could have been better. So far, a wide majority of shareholders were promoters and this episode has put a big question mark if the new shareholders will be rewarded in the same way going forward. InterGlobe Aviation IPO will be the first airline IPO in India since Deccan Aviation’s listing in 2006. It will also be India’s biggest market offering since 2012 Bharti Infratel’s INR41 billion public issue. Sadly, greatness doesn’t stay in numbers, rather it resides in policies. Like most other IPOs this year, InterGlobe Aviation IPO has also fallen victim to the ill-advised policy of leaving nothing on the table for small investors. Without doubt, the promoters and management need to be rewarded for the risk capital and operational excellence respectively; however, a little restraint wouldn’t have harmed them either. The scarcity premium is too evident to the promoters and bankers and thus, they will get away with the steep pricing of the IPO. Small investors would do well to remember the pitfalls of full pricing of IPOs which often leaves a thin margin to fall back upon should things go a little rough. It doesn’t take rocket science to understand how much upside or downside is there in terms of streamlining operations and improving aircraft utilization rates. A lot of external tailwinds were also helpful to IndiGo in reporting these numbers and these factors are not going to remain positive forever. Fuel prices, for example, will start moving up sometime, may be next year. In totality, we are greatly disappointed with the pricing of the IPO and the apparently opportunistic dividend payment. InterGlobe Aviation IPO is a great story that peaks out early in rewarding shareholders. 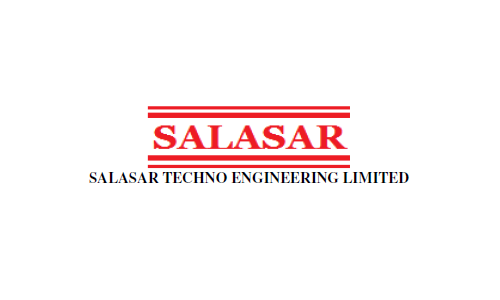 Salasar Techno Engineering IPO Review: Techno viable? Hello Krishna banga sir…thanks for your advice but I want to ask one thing….the subscription of interglobe ipo for the very first day was quite impressive specially from the QIB and anchors investor it means they are very bullish …what does it mean please explain …. Subscription levels should not be taken as an indicator of potential returns. If you are in doubt, just see what happened in the case of Power Mech Projects. Final subscription of 26 times, but shares are still trading below issue price. By no means this should be considered a prediction for InterGlobe, in fact it may offer nominal returns on listing but we continue to believe the company has left little on the table for small investors. Hi Harshit, listing gains appear increasingly probable in both but safety margin is pretty low in InterGlobe. We tend to avoid taking extremely short calls as lot of things can have adverse impact in the next 15 days, oil prices for example. InterGlobe has a lot of retail push but we find SH Kelkar a better bet on fundamentals. Thanks for the feedback!! We are glad our research was helpful to you, feel free to let us know how we can further improve.